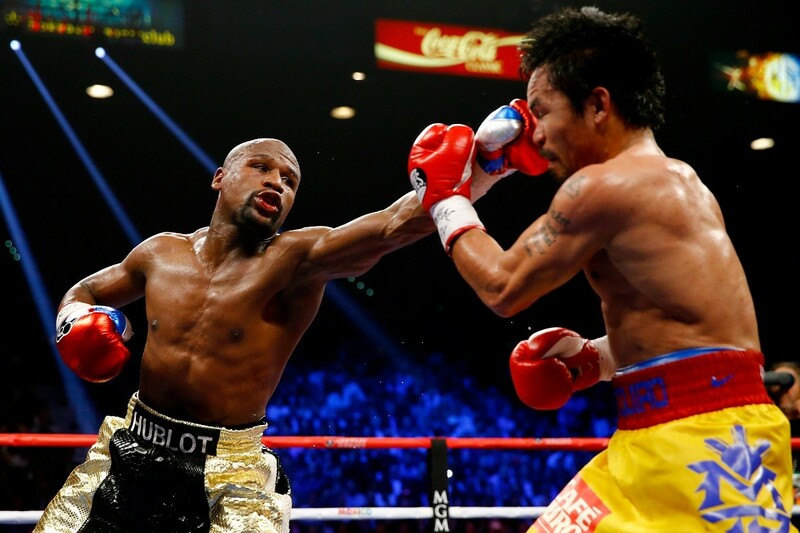 The Final, Final, Final Paycheck Numbers For Mayweather-Pacquiao Were Just Released… And They Are Staggering!!! When Floyd Mayweather and Manny Pacquiao finally agreed to fight back in May, there was one thing we knew was going to happen: These guys were going to make a ridiculous amount of money for a single night's work. In the weeks since the fight, we have heard all kinds of speculation and rumors as to what the final numbers would be. Well, it looks like we now have a really good idea as to what those final numbers are going to be, and as expected, they are absolutely ridiculous. For 36 minutes of work, Floyd Mayweather is going to gross somewhere between $220 and $230 million. That's around $6.1 million per minute in the ring. Roughly $101,851 per second. For his efforts, Manny Pacquiao is going to gross at least $150 million. That comes out to $64,814 per second. As a Nevada resident, Floyd will pay $90 million to the IRS after deducting an estimated 5% of his earnings for fight-related expenses. There is no state income tax in Nevada. In other words, Floyd will deposit $130 million into his bank account thanks to this one fight. It took Tim Duncan his entire 18-year NBA career to earn $230 million. It has taken New York Yankees outfielder Carlos Beltran 17 seasons to make $209 million. Peyton Manning has earned just shy of $230 million during his 18-year career. During Michael Jordan's entire NBA career, he grossed $90 million. That's $140 million less than Floyd made in one night. Five NASCAR drivers have yet to earn as much this season as Mayweather did in one second, and over 100 golfers currently on the PGA Tour have yet to make $100,000 as well. Of the active players in North America's top three sports (NFL, NBA, and MLB) the only ones that have earned more over the course of their careers than Mayweather did for one fight are Kevin Garnett ($323 million; 20 seasons), Kobe Bryant ($298 million; 19 seasons) and Alex Rodriguez ($401 million; 20 years). Manny Pacquiao's $150 million take is as much as Eli Manning's career earnings ($150.7 million; 12 years) and Tom Brady's ($149.8 million; 16 years). Tiger Woods is the only golfer who comes close, with $109 million over the course of his lengthy career. The only NHL player that comes close is Jaromir Jagr ($128.8 million; 21 years). LeBron James has yet to make as much during his 12-year career ($146 million). In 18 seasons, Boston Red Sox designated hitter David Ortiz has made just $144 million. Jeff Gordon has not earned as much as Manny after driving in close to 800 races over his 24-year career ($144.6 million). $230 million is more money than the entire value of at least three NHL franchises. It's more than the entire payroll of every single team in the NHL, NBA and NFL. It's more than the entire payroll of every MLB team minus the Dodgers. If Floyd was a movie, at $230 million in earnings he would be the 11th highest grossing movie of 2014. If Floyd was a country, Floyd would be the 185th largest country in the world in terms of GDP (out of 188 countries currently recognized by the IMF). So Mom and Dad, next time junior comes home and says he got into a fight, don't be mad. If he's any good, it could be the road to easy street for everyone.